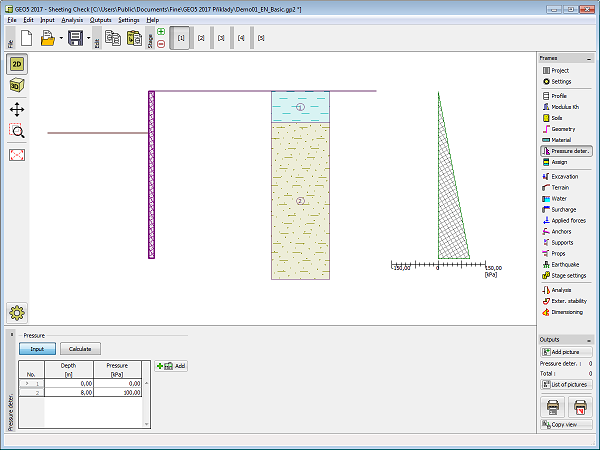 The frame "Pressure determination" allows to input the values of earth pressure behind sheeting structure manually (by pressing the "Input" button). The frame is accessible only in the case, when in the "Settings" frame is selected an option "JGJ 120-2012" (the "Pressure Analysis" tab). This frame contains a table with list of the input values of earth pressure. Adding of these values is performed in the "New point" dialog window, where is specified the depth of point [m] and the value of earth pressure [kPa]. It is possible to calculate the values of active earth pressure, or earth pressure at rest automatically (by pressing the "Calculate" button).